Articulated streamers are the rage these days, so I thought for the Streamer Challenge, why not cook up an articulated streamer that's castable with a tenkara rod? 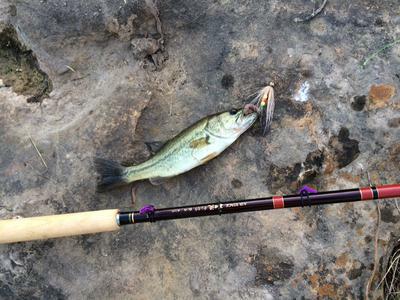 An actual tenkara rod, not a stiff keiryu rod or a carp rod. This was my first attempt. I can't complain about the action of the fly. It works exactly as I wanted it to, like a suspending jerkbait. It's close to neutrally buoyant, and it darts like the venerable Sluggo soft-plastic jerkbait when "pulsed." The fly is pretty rough looking, but the fish seemed to like it. I caught several largemouth bass and two overachieving bluegills. The front section is simply bucktail on a size 4 Gamakatsu B10S, tied Thunder Creek Minnow style with a bit more "flair" than normal. The articulation joint is 15 lb mono with 3 plastic beads. The tail section is a very thick chenille yarn used for making baby blankets on a size 6 B10S, with a bit of soft hackle around the front. As for casting...the only true tenkara rod I own that could cast it effectively is my Nissin Air Stage Fujiryu 410 6:4, and then only with the 4.0 m Nissin PALS SP Pro tapered twisted fluorocarbon line. When wet, it's far too heavy for easy casting with most tenkara rods. The chenille tail section acts like a sponge and soaks up a lot of water. It's way too much for either my Tenkarabum 36 or my Nissin Pro Square 360 6:4. The latest iteration substitutes bucktail for the tail section, and is down-sized and tied more sparsely with a size 8 B10S for the tail section and a size 6 B10S for the head section. I left out the beads. I may have to fine tune with a little lead wire to get the neutral buoyancy I want. I haven't had a chance to fish or photograph it yet, so stay tuned. It seems to me that making a castable fly is the crux of streamer fishing with a tenkara rod. Ideally, I want a decently large fly that's halfway pleasant to cast and will quickly sink down towards the fish. Sparse bucktail patterns are one of the obvious options, but there are other ways. I've been borrowing techniques from the guys who fish really huge flies and downsizing them. To achieve a bulky fly without the weight, their flies are mostly slim shanks with sparse collars supported by stiffer material. Synthetics are helpful in that they don't absorb water much. By the end of this challenge, I expect quite a few of us will have boxes full of very dialed-in tenkara streamers. Phillip, I think you're right. I have been playing around a bit with Muddler Minnows, and Gapen's original tie is a definite possibility. The original Muddler Minnow had a very open sparse deer hair head, not the tightly packed heads you see on modern versions. When thoroughly soaked and tied on a heavy hook they sink pretty well. (The Muddler photos I've posted on the Streamer Challenge Gallery page are NOT the sparse Gapen ties, though.) Another alternative is a split shot 8-12" above the fly, which also works nicely. I am tying a couple of simple streamer patterns that give an articulated action in a very streamlined and simple way, through the use of 1 or 2 lengths of Micro-Barred Ostrich Herl plumes. On the Herl Thing, a #14, Black Jig Hook is the platform, Fl-Chartreuse 70D UTC thread is used, with a 2mm black nickel bead, stab a fine length of copper ribbing wire in the bead and wrap it down the hook bend with the thread. Tie in the grizzly Barred Ostrich herl 1 1/2 to 2 hook shank lengths long for a tail (with a couple of thread wraps only) keeping the tag end of the herl up and out of the way, wrap the thread back up to a bead length behind the bead, and half-hitch. Palmer the herl forward over the thread in 1/2 herl-wide evenly spaced wraps to the open space to where the thread is waiting, and tie it off but do not trim the excess away. Then rib the body up the thread open spaces and tie off the rib at the waiting thread and herl tag end. With the remaining herl, form a tight collar hackle right behind the bead, and whip finish (with a little Super Glue applied to the thread before tying the knot), whip finish wide enough to form a nice little Hot Spot and the fly is complete. The Slinky uses a Daiichi 1770 Swimming Nymph Hook, in size #14, with a 3/32" Tungsten Black Bead, and 2 Micro Barred Ostrich Herls of your color preference. The thread and Ultra Micro Chenille colors used on this pattern will also be of your choosing. Tie the thread in at the back of the bead head and tie the Micro Chenille in there as well, and wrap the chenille on top of the hook shank to the hook bend. Tie in the Barred Ostrich herls (1.5 to 2 hook shank lengths long with a couple of thread wraps at the bend), and then holding the herl out of the way after the first chenille wrap over the herl tie in point, wrap a tight chenille body all the way up to the back of the bead, and tie the chenille off winding the thread back to a one bead head width, and let it hang. Now palmer wrap both ostrich herls together at the same time up the chenille under tension so they will sink down in between the chenille wraps until you get to the waiting thread. Then wrap a tight collar hackle to the back of the bead head. Again, whip finish with Super Glue applied to the thread, and form a hot spot with your fluorescent colored fly tying thread to finish off the fly. Although not the most durable fly tying material in the world, the grizzly died ostrich herl is very translucent, extremely mobile, cheap, compact, and very easy to tie with, and makes for much easier casting and sinking streamer patterns than flies tied with the Slinky Worm materials. So far my larger streamers have been smaller rabbit strip zonkers tied on size 8 and 10 bone fish hooks. I'm basically lobbing them past carp and gar with the Kiyose 53M and pulling them back to the (hoped for) strike zone. Finesse casting this ain't. I just bought some true streamer hooks and will be tying some longer bucktails, maybe I'll work up to a articulated joint. I'm also a fan of using synthetics to keep the water weight down. This challenge has got people pushing into new territory which is great. I've since gone through several iterations of my tenkaraticulation fly. V 2.0 was downsized and both the head and tail sections were bucktail. This fly was very castable, but despite the articulation didn't have much action. V 3.0 attempted to remedy this by making the tail section of marabou, in order "grab" a bit more water for better action. It still lacked the wiggle of the larger version. V 4.0 proved to be a winner. The tail section was basically a white mini-deceiver. The head section was pink crystal chenille body with a bucktail head/collar. This fly cast well and had good action. 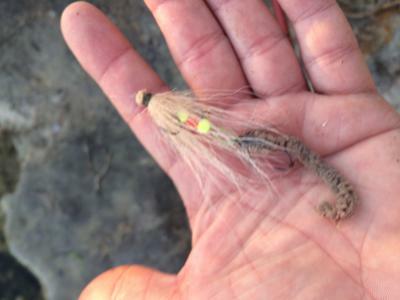 After a few bluegills fell for it, the fly was seized by something BIG. I never saw the taker, only a large swirl on the surface. The fish headed straight for deeper water and I couldn't turn it despite the fact that I was using my 26-penny Nissin Fujiryu 410 6:4 because I knew there were some good-sized fish (LM bass, channel catfish, carp) in the lake. I tried the side to side tactic but this fish was having none of it, and the 4x tippet soon broke. I guess I'll be tying more of V 4.0!